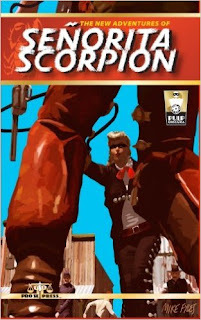 This anthology published by Pro Se Productions includes the story "Wanted: Señorita Scorpion" by my fellow New Wold Newton Meteoritics Society member Brad Mengel. Bounty hunter Bellem pays a call on Anse Hawkman at the advice of Waxahachie Smith. Hawkman wants Bellem to track down the outlaw Señorita Scorpion, who is said to shoot faster than Dusty Fog. Bellem dented his rifle pistol-whipping a man he was paid to track down by a banker in Yellowdog. Waxahachie Smith, Dusty Fog, and the town of Yellowdog are from the Floating Outfit novels by J. T. Edson, which are already firmly in the CU. Therefore, this crossover brings in Les Savage, Jr.’s Señorita Scorpion, who appeared in eight stories in the pulp magazine Action Stories from 1944 to 1949.